On August 16, 1777, a rebel force of a couple thousand militiamen prepared for the Battle of Bennington. The American Revolutionary War was about two years old. General John Stark led the brigade, reinforced by a crew of Vermonters including Col. Seth Warner and Ethan Allen’s Green Mountain Boys. Long story short: the Brits lost. Today, Bennington commemorates the battle with a 300-foot stone obelisk in the center of Monument Circle. Though the clash technically happened 10 miles away in Walloomsac, N.Y., the monument itself draws a crowd of American history aficionados and touring parents visiting their student offspring at Bennington College. After admiring the towering column — and silently acknowledging that the “Battle of Bennington” sounds much better than the “Battle of Wallomsac” — a visitor might need a spot to eat, sip and recall high school notes on the Boston Tea Party and Treaty of Paris. Here are a few preferred spots. South Street Café & Bakery is marked by two floor-to-ceiling windows and an old, brass-handled double door. Natural light floods the interior, where a soft beryl paint job accents hardwood floors; there are wide wooden tables for eating and a couple plush couches and armchairs for reading. A changing exhibition of local artwork decorates the walls. On a particularly warm afternoon in late September, the café is filled with patrons sipping iced maple lattes, Italian soda and mugs of mulled cider, while a local performer strums her guitar to an original song. The café was passed to new ownership in 2015, when couple Maeve Webster and Brian Darr teamed with Darr’s brother, Stephen, to run the small coffeehouse and eatery. A menu of mostly local fare — from Vermont Coffee Company to Maple Meadow Farm — complements housemade breads, quiche, soups and an alarmingly caffeinated drink called the Iced Voodoo: four shots of espresso, chocolate, half-and-half and whipped cream. The British may have lost the Battle of Bennington, but they kindly left their penchant for damn good fish and chips. Lil' Britain is a casual spot that's small and spare, with a handful of tables and metal chairs settled across the tile flooring. On one wall, storage shelves sell favorite staples of the British cupboard such as Cadbury Flake chocolate bars, PG Tips tea, McVitie’s Digestives and jars of Marmite. The menu includes housemade meat pies, sausage rolls and bangers and mash, but fish and chips are the kitchen's heartbeat; they're the kind you’d hope to find when a gray drizzle has left you chilled and ravenous. The French fries are proper British chips; thick-cut and square, the perfect vehicle for a tangy hit of malt vinegar or Heinz tomato ketchup. Beside your pile of chips, a long fillet of fresh cod is battered and fried until its shell is craggy and caramelized. Do it right and order a side of mushy peas. Bakkerij Krijnen sits at the top of Main Street about a mile from the town’s center. The otherwise unassuming storefront is marked by a three-foot yellow tulip sculpture, a pastel bicycle hanging over the entryway and a smell of butter that would make any militiaman week in the knees. It’s helmed by husband-and-wife team Hans and Jennifer Krijnen, who met in the late ’80s at the Four Chimneys Inn and Restaurant down the road. Hans, newly relocated from his home in Holland, was the pastry chef; Jennifer was the waitress. The couple opened Bakkerij Krijnen in 2005, after a fledgling business selling traditional Dutch stroopwaffles outgrew their small wholesale operation. 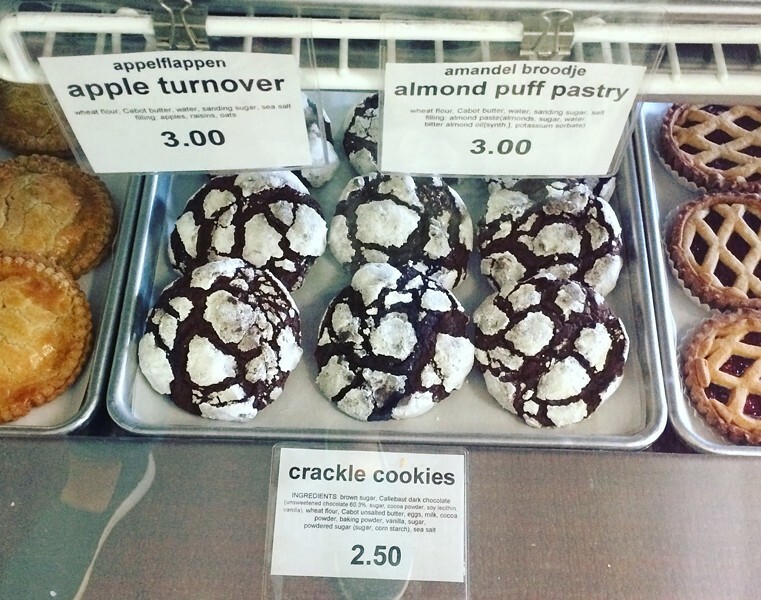 The ginger stroopwaffles — two dark wafers sandwiching ginger-laced caramel — s the Krijnens' specialty, but the bakery is stocked with other gems including chocolate crinkle cookies, almond shortbread, ganache-filled tulips, Linzer tortes bloated with raspberry preserves, and marzipan spice cakes that smell like Christmas. There are also homemade sourdough loaves and well-burnished baguettes; puff pastries stuffed with walnuts, feta and local beets; and one towering, flame-kissed lemon meringue pie. A pair of whiteboards out front have a handwritten list of local ingredients. Whatever isn’t local, such as cane sugar and sesame seeds, is mostly organic, fair trade and non-GMO. Aside from Callebaut’s Belgian chocolate and Douwe Egberts Coffee — a nod to Hans’ European roots — virtually everything at Bakkerij Krijnen has a regional origin. Tucked in a back corner by a stack of maple cookies is a framed, typed note from Sen. Bernie Sanders congratulating the couple on their “Editor’s Choice” award from Yankee Magazine. “Vermont is fortunate to have members of its community who show such dedication to their work,” he writes. Bernie has a point.